… I drive off without a care on the road to dreams. I forget about Hiroshima, Auschwitz, Budapest. I forget about Vietnam, the housing problem, the famine in India. I forget about everything except that I’m back at zero and have to start out from there. Le Gai savoir is a feature-length cinematic essay consisting of a series of dialogues between Patricia (Juliet Berto), identified as the Third World delegate to the Citroën plant in the North Atlantic, the daughter of Lumumba (2) and the Cultural Revolution, and Émile Rousseau (Jean-Pierre Léaud), later identified as the ancestor of the Enlightenment philosophe Jean-Jacques Rousseau. Early on, Patricia declares, “I want to learn, to teach everyone and myself, to turn against the enemy the weapon which he uses to attack us: language”, providing Godard’s own point of departure, the Bazinian ontology he extolled as a Cahiers du Cinéma critic: “cinema is also a language.” (3) Television is clearly the ideal medium for disseminating the instruction needed to disarm the “enemy”, since, according to Patricia, it guarantees access to “every bedroom”. Alone in an abandoned television studio, they liken their predicament to that of Robinson Crusoe shipwrecked on an isolated island. 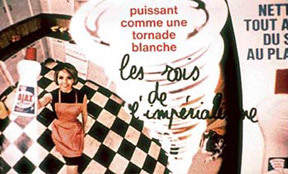 They ruminate on the political primitivism of France in 1968, the reformism of the Communist Party, unable and unwilling to assume power, as well as their disdain for the fare emanating from the film industries of Hollywood and Moscow, the British Broadcasting Corporation and, among others, O.R.T.F. (which had initially financed the film). Their goal is defined not simply as starting from zero, but to return to zero, hence to proceed without any ideological encumbrance. They conclude that an investigation of sounds and images is warranted and organise a three-year plan as such, an undertaking that will realize both their practical and theoretical aspirations, and thereby truly exemplify the joy of learning. During the first year, their tasks are to collect images, record sounds and conduct experiments, including an extended word-association interrogation of a young boy and an elderly artisan saddle-maker. Among the more notable associations made by the boy is his pairing of the word ‘revolution’ with the month ‘October’. The sentiment and the conclusion of Year I are conveyed non-diegetically through a steady stream of photos and cartoon images on which is inscribed the text: “Henceforth we refuse to accept any kind of self-evident truths. We do not believe that there exist any self-evident truths. Self-evident truths belong to bourgeois philosophy”, a postulate that would be reiterated by one of the narrators in Godard’s Dziga-Vertov film, British Sounds (1970). 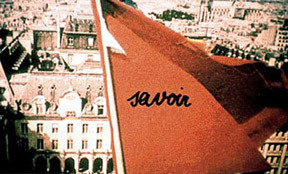 Throughout the course of the film, Godard seeks to estrange the audience of Le Gai savoir from any semblance of a narrative by a multiplicity of extradiegetic devices of both a visual and an aural nature: photographs of historical personages, images and advertisements of popular culture, passages from Wolfgang Amadeus Mozart, a Cuban revolutionary anthem, as well as Godard’s own voice-over commentary accompanied by unnerving radio static. In the last scene of the film, Émile announces that he’s departing for Bratislava to shoot a film with Jerzy Skolimowski, the director with whom Jean-Pierre Léaud made Le Départ in 1967. Patricia complains that the film is incomplete; half the shots are missing. Émile reassuringly assigns these shots to kindred filmmakers such as Bernardo Bertolucci, Jean-Marie Straub and Glauber Rocha. After briefly contemplating if the film itself is a failure, the actors bid each other farewell, actually using their real names (for Brechtian effect): Émile says “Godspeed, Juliet”, Patricia retorts “God is Dead! Jean-Pierre”, a direct reference to Friedrich Nietzsche’s collection of aphorisms, Die Fröhliche Wissenschaft, the French translation of which is Le Gai savoir. Godard concludes his commentary with the didactic and non-dogmatic disclaimer: “This is not the film which should be made, but shows how, if one is making a film, that film must follow some of the paths shown here.” Having returned to zero, Godard embarked on the most audacious enterprise of his career and of the history of filmmaking: the Groupe Dziga-Vertov. Colin MacCabe, Godard: A Portrait of the Artist at Seventy (New York: Farrar, Strauss & Giroux, 2003), p. 207. Patrice Emery Lumumba (1925-1961) was the first democratically elected Prime Minister of the Democratic Republic of the Congo. He was deposed, arrested and later murdered by Colonel Joseph Mobutu with the connivance of Western intelligence services. André Bazin, “The Ontology of the Photographic Image”, What is Cinema? Volume 1, translated by Hugh Gray (Berkeley: University of California Press, 1967), p. 16. The quotation is from The Impending Catastrophe and How to Combat It (October 1917): “state-monopoly capitalism is a complete material preparation for socialism, the threshold of socialism, a rung on the ladder of history between which and the rung called socialism there are no intermediate rungs.” V. I. Lenin, V. I. Lenin: Selected Works in Three Volumes (Moscow: Progress Publishers, 1970), Vol. II, p. 270.